To a lot of people, the first indicator of Spring is birds chirping around 6AM in the morning. Hopefully you don’t have this bird outside your window imitating the sounds of a car alarm. Here at Jersey Ice in Elizabeth, NJ, our first indicator of Spring is the whir of our Italian ice machines producing Little Jimmy’s Italian Ices at around 6AM in the morning. 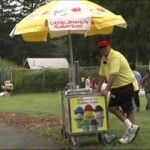 As they say, the early bird catches the worm- now is the time to order your Italian Ice pushcart and Italian Ices for the 2012 Spring season which is 30 days away. Give us a call to place your order at 800 763 4348.